During the last years, the consumers have been interested in everything related to the characteristics and the quality of food products. The consumers are interested in healthy agri-food products and require food safety and authenticity. It is clear that the guarantee of origin is one of the most characteristic demands for the consumer, being this fact very important in the wine sector. As it knows, wine is a complex alcoholic beverageand it is one of the most consumed alcoholic beverages in the world. Wine authenticity is guaranteed by national guidelines nevertheless, wine adulteration is a historical common practice (for example diluted with water) but in the last centuries, some practices were improved (mixing practices, for example) . The new analytical techniques for the quality control can be used, such as i) mass spectrometry (GC-MS, ICP-MS, etc. ), ii) spectroscopy (NMR, IR, etc. ), iii) separation (HPLC, GC, etc.) and iv) other techniques (sensory analysis, etc. ).The analysed components obtained by these techniques can form a characteristic “fingerprint” . Different analysis and treatment of data such as i) Cluster Analysis (CA), ii) Principal Component Analysis (PCA), iii) Linear Discriminant Analysis (LDA), iv) K Nearest Neighbour (KNN) or v) Multiple Linear Regression (MLR), can be used to correlated the data analysed with a specific wine property . Besides these, there are other kinds of methods that can be used to study different wine properties according to the constituent components. An example is the Artificial Neural Networks (ANNs), a kind of Artificial Intelligence method that can be used to determine different wine-making processes but this is not its only chance, on literature can be found different applications focused on classification or in prediction of wine process conditions. An example of this is the research developed by Jurado et al. to differentiate four Spanish white wines under certified brands of origin. Their ANN model obtained a prediction of 100% for all the classes considered. Artificial models were also used to classify seventy commercial rose wines using different variables measured for the certificated brands: Ribera del Duero, Rioja, Valdepeñas and La Mancha. The classification model included different input variables such as metals, classic enological parameters, among others.Even, ANN are capable to classify wines from different countries (Spain, France and Italy). 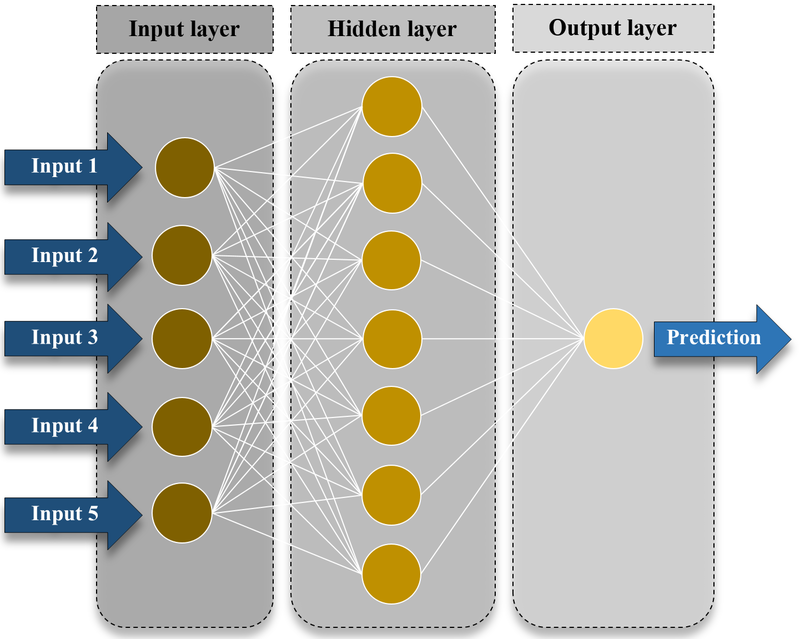 Nevertheless, neural networks can not only be used to differentiate or classify wines but also to detect problematic wine fermentations using different parameters. In fact, researchers predicted, with accuracy, problematic fermentations with only three parameters (such as sugars, alcohol and density). A shorter scale study was carried out with Canary Islands wines and the obtained neural model could provide a good prediction ability (over 99%). ANNs can be used to recognise adulteration practices, in this case in Italian wines, using thin-film multisensory array. Figure 2. Scheme of an ANN architecture. 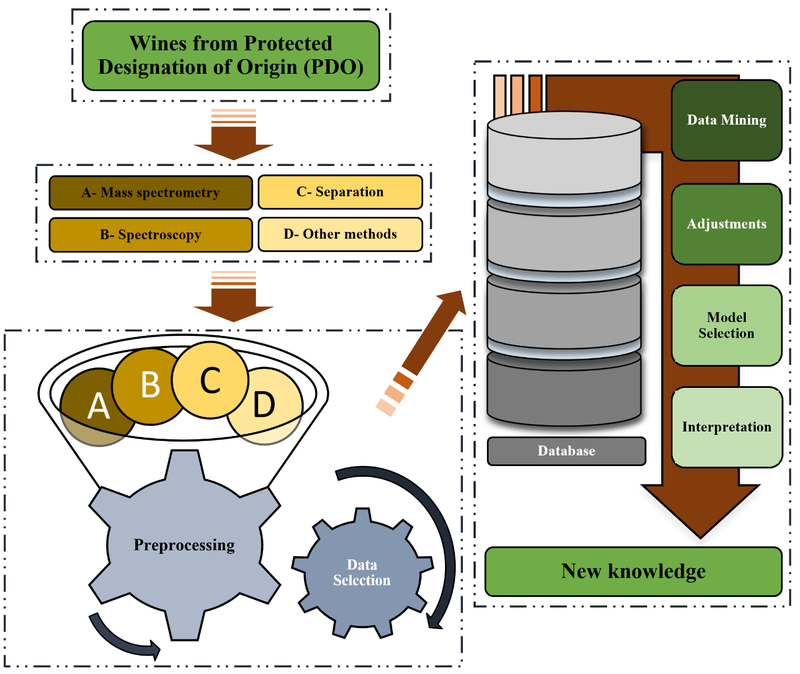 ANNs models could be interesting and beneficial for the wine sector to ensure the quality and safety of wines under a Protected Designation of Origin (PDO) and to improve its trade nationally and internationally. Javier Saurina; Characterization of wines using compositional profiles and chemometrics. TrAC Trends in Analytical Chemistry 1970, 29, 234-245, 10.1016/j.trac.2009.11.008. Dion M.A.M. Luykx; Saskia M. Van Ruth; An overview of analytical methods for determining the geographical origin of food products. Food Chemistry 1970, 107, 897-911, 10.1016/j.foodchem.2007.09.038. Rapeanu, G. ; Vicol, C. ; Bichescu, C.. Possibilities to asses the wines authenticity. ; Galati University Press: Galati (Romania), 2009; pp. 1-9. Leqian Hu; Chunling Yin; Shuai Ma; Zhimin Liu; Rapid detection of three quality parameters and classification of wine based on Vis-NIR spectroscopy with wavelength selection by ACO and CARS algorithms. Spectrochimica Acta Part A: Molecular and Biomolecular Spectroscopy 1970, 205, 574-581, 10.1016/j.saa.2018.07.054. O. A. Moldes; Juan C. Mejuto; R. Rial-Otero; Jesus Simal-Gandara; A critical review on the applications of artificial neural networks in winemaking technology. Critical Reviews in Food Science and Nutrition 1970, 57, 2896-2908, 10.1080/10408398.2015.1078277. Maria J. Latorre; Carmen Garcia-Jares; Bernard Médina; Carlos Herrero; Pattern Recognition Analysis Applied to Classification of Wines from Galicia (Northwestern Spain) with Certified Brand of Origin. Journal of Agricultural and Food Chemistry 1970, 42, 1451-1455, 10.1021/jf00043a012. S Rebolo; R.M Peña; M.J Latorre; S Garcı́a; A.M Botana; C Herrero; Characterisation of Galician (NW Spain) Ribeira Sacra wines using pattern recognition analysis. Analytica Chimica Acta 1970, 417, 211-220, 10.1016/s0003-2670(00)00929-6. Rosa M Peña; María J Latorre; Sagrario García; Ana M Botana; Carlos Herrero; Pattern recognition analysis applied to classification of Galician (NW Spain) wines with Certified Brand of Origin Ribeira Sacra. Journal of the Science of Food and Agriculture 1999, 79, 2052-2056, 10.1002/(sici)1097-0010(199911)79:14<2052::aid-jsfa485>3.3.co;2-v.
Elvira Soto Vázquez; Susana Río Segade; Ignacio Orriols Fernández; Effect of the winemaking technique on phenolic composition and chromatic characteristics in young red wines. European Food Research and Technology 2010, 231, 789-802, 10.1007/s00217-010-1332-5. José Luis Aleixandre-Tudó; Inmaculada Alvarez; María José García; Victoria Lizama; Jose Luis Aleixandre; Application of multivariate regression methods to predict sensory quality of red wines. Czech Journal of Food Sciences 2010, 33, 217-227, 10.17221/370/2014-cjfs. Gonzalo Astray; J. X. Castillo; J. A. Ferreiro-Lage; J. F. Galvez; Juan C. Mejuto; Artificial neural networks: a promising tool to evaluate the authenticity of wine Redes neuronales: una herramienta prometedora para evaluar la autenticidad del vino. CyTA - Journal of Food 1970, 8, 79-86, 10.1080/19476330903335277. Halil Baykal; Hatice Kalkan Yildirim; Hatice Kalkan Yıldırım; Application of Artificial Neural Networks (ANNs) in Wine Technology. Critical Reviews in Food Science and Nutrition 1970, 53, 415-421, 10.1080/10408398.2010.540359. Jose Marcos Jurado; Oscar Ballesteros; A. Alcazar; F. Pablos; M. J. Martin; J. L. Vílchez; A. Navalón; Differentiation of certified brands of origins of Spanish white wines by HS-SPME-GC and chemometrics. Analytical and Bioanalytical Chemistry 1970, 390, 961-970, 10.1007/s00216-007-1740-y. Pérez-Magariño, S.; Ortega-Heras, M.; González-San José, M.L. ; Boger, Z.; Comparative study of artificial neural network and multivariate methods to classify Spanish DO rose wines. Talanta 1970, 62, 983-990, 10.1016/j.talanta.2003.10.019. Luca Montanarella; Maria Rosa Bassani; Olivier Bréas; Chemometric classification of some european wines using pyrolysis mass spectrometry. Rapid Communications in Mass Spectrometry 1970, 9, 1589-1593, 10.1002/rcm.1290091525. R. César Román; O. Gonzalo Hernández; U. Alejandra Urtubia; Prediction of problematic wine fermentations using artificial neural networks. Bioprocess Biosyst Eng 1970, 34, 1057-1065, 10.1007/s00449-011-0557-4. Juan-Pedro Pérez-Trujillo; Mireille Barbaste; Bernard Médina; Chemometric Study of Bottled Wines with Denomination of Origin from the Canary Islands (Spain) Based on Ultra-Trace Elemental Content Determined by ICP-MS. Analytical Letters 1970, 36, 679-697, 10.1081/al-120018257. M Penza; G Cassano; Recognition of adulteration of Italian wines by thin-film multisensor array and artificial neural networks. Analytica Chimica Acta 1970, 509, 159-177, 10.1016/j.aca.2003.12.026.